After MUCH pondering (yes, STILL pondering), I think I may have a good, attainable solution to my wardrobe crisis. FOR REAL THIS TIME. First, I thought, "Capsule wardrobe. That will make all of my vintage clothing mix and match and be awesome." But really.... do "vintage" and "capsule wardrobe" ever belong in the same sentence? Be real. No. So my next thought was, "I want a harder edge and more matchability, so I'll just have most of my wardrobe be neutral colors like black, brown, and gray. Classic, right?" And alas... I. Can't. Not. Wear. Color. I like gaudy things. It just wouldn't work for me. My thought now, the one that I think will do it, is to build up my solid basics. I can still sew lots of dresses and have fun, colorful prints, but having solid-colored basics will make all of those things far more wearable for me than they are now. My non-practical self hates to spend money, especially a lot of money, on a "boring," single-color garment with no pizzazz... but turns out they're REALLY necessary! They're not so boring to me now! 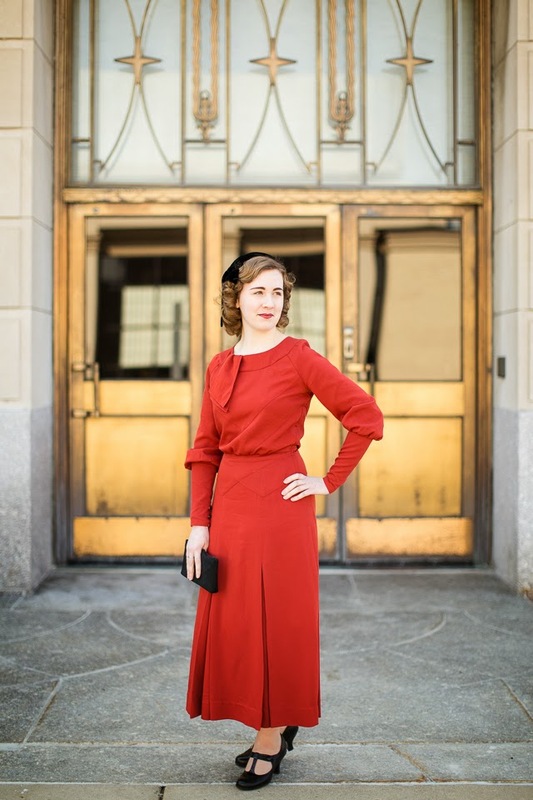 I've also found that my red dress, blue suit, and tan sweater are some of my most-worn items because they go with so many things. Major facepalm. OF COURSE solid colors are versatile. Why didn't I connect the dots before?! This classic skirt from The Gold Hatted Lovers is exactly what I'm looking for. Extremely simple, versatile, viscose-y magic! AND they come in my size! Wooohooo! I would take a similar skirt in gray, too. Yes, that is very specific, but wool gabardine is just the best for trousers and skirts, in my opinion, and that's what I want! These trousers from Puttin' on the Ritz would do nicely! I also adore the fact that they make these according to your measurements. I'm very curious to buy a pair and see how that goes sometime! Anyone tried them out? Preferably still in a solid color for versatility, I really want to try this decade out! I drool over it often in photos, and I think I might just be able to rock it! 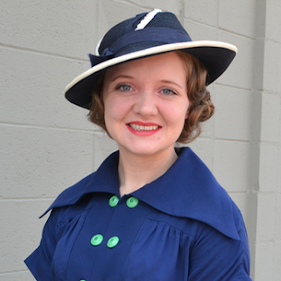 This suit from Revamp Vintage is pretty fantastic, and I like the option of wearing the pieces separately, too. I tried to find another example, but let's just be real, I want Lily's dress. 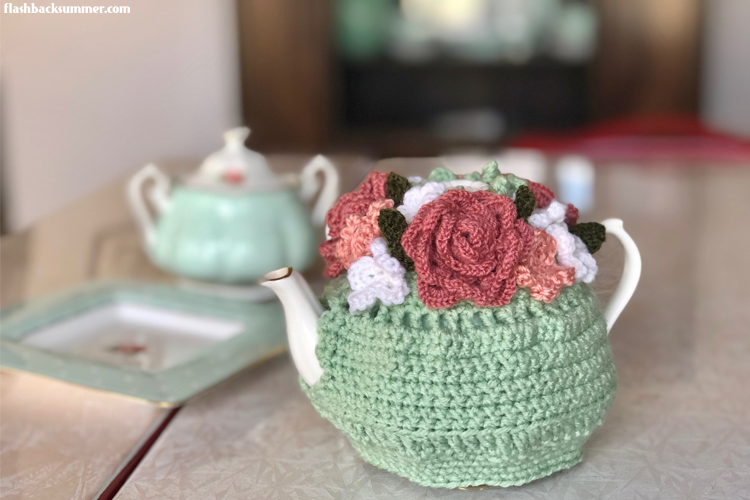 (She blogs at Mode de Lis, go follow her and her sewing fabulousness!) It's just perfect. A solid color makes it easy to mix-and-match, and it's an office-appropriate easy outfit. I may not be able to recreate Lily's dress, but I will try to incorporate awesome details and seaming like she did! Classic. Mix and match easiness. 'Nuff said. I liked this skirt with a drape detail from Olga Johnson Etsy shop. I wasn't able to find a reproduction version of this (if anyone knows of one, tell me! ), but I'd like one like the one below, and I'd like it in.... gasp.... GREEN. I'm currently knitting a 30s sweater that is white and green, and I keep envisioning how fantastic it would look with a full suit! (This photo is from Glamourdaze.) OH OH, with a matching hat! This suit from Heyday is fantastic! I have a brown suit, but it's actually made of a sundress under a jacket, so I'd like to get a skirt and jacket combo. I work in an office, and I just need more business-appropriate options. Plus I just plain ol' love suits! I could really make this list so much longer. I feel like one can never have too many solids; they go with everything! Have you gotten anything from any of the reproduction brands above? How did the garment work for you? Are there any solids you need to add to your wardrobe? None of the companies I've highlighted above have compensated me in any way for this highlight. I just like their stuff! But if anyone happens to want to collaborate.... let's talk. I'd forgotten about Puttin' on the Ritz - must go check out their stuff again! I've not ordered from any of these before, but Heyday are on my radar. My problem with them is that they often use the lovely Fleur as their model as above... and she's about twice the height of me (us!). So I know everything that fits her well would look abysmal on me without massive alterations, hence I've always avoided them... So often the problem! I actually just saw her pattern, and I bought it! I was glad it didn't have any pleats like a lot of vintage styles do. I can't wait to try it! Also, HECK YES on collaborating. Any time. All the time. These are nice, versatile items which one could build a wardrobe around. Solids always look good. It's truly awesome that you've hit upon so many wardrobe elements that not only work for you, but that you love and that you have a clear vision of how you want to drive your closet, so to speak, in the future. Way to go, girl! I've purchased from Heyday before multiple times and highly recommend their offerings. They're well made, comfortable, very vintage looking (natch), and super stylish to boot. Basics are so key! A solid colored suit will be so useful to you, especially since you work in an office. My suit is more of a two piece dress than a suit (ie no crazy tailoring required) and it's great. My wardrobe architect sort of failed too. I'm in between careers right now so I'm just sewing whatever I want (mostly solid basics though) and I'll figure out work appropriate things when I figure out where I'm going to be working next. 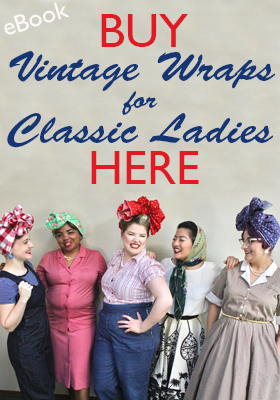 I think this is an awesome way to marry your love of vintage to your professional needs. All of these items are beautiful, classic, and totally in keeping with the things you love already. I'm really drooling over some of those pieces myself - that first skirt is simple and divine, and I'm really digging that Heyday suit too. Good luck getting everything together, I think you've got some great ideas. I thought so, too! I love that vintage pieces like these, especially solid colored ones, really are timelessly appropriate for the office. They're classic, tailored, and fantastic! I'm glad your re-inspired with your wardrobe! At first block coloured basics seem very boring but once you realise the endless possibilities of wearing all of your favourites that had nothing to match it becomes much more fun. Great ideas! This does seem to answer many wardrobe dilemmas. I tend to dislike the "menswear" trend as I like very feminine clothes, and also could not ever stick to neutrals, or even just to solids. The problem is that many items that I love, with bows or lace or other girly trim, tend to not pair well together. These items you have listed are good to pair with more feminine items. One thing you had quite some time ago on your blog, I don't remember exactly when but probably more than a year ago, was a lovely Victorian inspired blouse. How nicely that would go with so many of these bottoms. 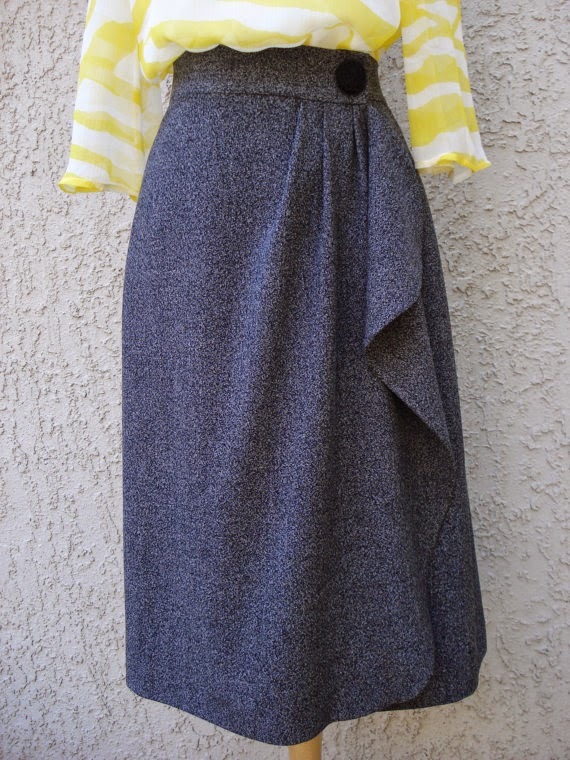 I think my favorite is the 1940s grey skirt with just a hint of ruffle. The 1920s suit is cute, but it seems like the silhouette from that era can be hard to wear when it comes to flattering the figure.